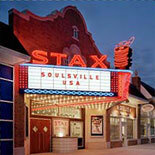 A visit to Memphis would not be complete without visiting the Stax Museum of American Soul Music. The museum is a treasure trove of the history of Memphis soul and Stax Records, an old soul and R&B record label. Highlights include 2,000 total exhibits, a 100 year old church, the expansive Hall of Records, a recreation of Stax’s Studio A, several award-winning photography exhibits and a location that is at the former site of the old Stax Records. The Stax Museum of American Soul is expansive and visitors should definitely take their time exploring. The first spot on the tour is the aforementioned 100 year old church. It was uprooted from the Mississippi Delta and reconstructed at the Museum to become an exhibit showing the beginnings of soul music. Another part of the introduction is an acclaimed documentary film on soul music. The exhibits throughout the museum highlight the contributions of legendary soul musicians such as Otis Redding, Isaac Hayes, the Staple Singers, the Bar-Kays, Johnnie Taylor, Little Milton, Booker T. & the MIGs, Al Green, Queen of Soul Aretha Franklin, Ike and Tina Turner and many others. Some of the exhibits include Halon Jones’ retrieved saxophone, Albert King’s well-known purple Flying V guitar, one of Tina Turner’s famous gold sequined dresses and Ike Turner’s silver suit as well as his Fender guitar. Plus Booker T. Jones’ organ that he used to record “Green Onions” and Isaac Hayes’ peacock blue 1978 Cadillac El Dorado decked out with gold trim, a television and a refrigerator. These are only some of the exhibits visitors will experience. There are also seasonal exhibits featuring many other musical icons. Tickets to the Stax Museum of American Soul can be bought at https://www.trustedtours.com/store/stax-museum-of-american-soul-music.aspx.